Over at FB Adventures in Stamping, this Sunday's challenge was using a french tip design. This is what I came up with. French tips are my nemesis...but I've been getting better on the lining up over time, but they are still far from perfect. So for this challenge, I thought if I *had* to do a french tipped mani, I was going to try using a traditional, white french tip image. Looking at my nails, while they have a little staining, they aren't terribly bad so I thought I could pull it off...maybe....but before stamping, I added a coat of China Glaze Love Letters for a hint of skin tone colour on my nails. Personally, I can hardly tell the difference that it was added. Then did french tipped stamping using m19 with Konad white stamping polish. I didn't line it up that well and I had to double stamp to cover all the tips. And about this point, I didn't think I was even going to do the mani so didn't even take a pix...then to top it off, I went to pick up a bottle of polish and really nicked the stamping on the middle finger. So I had to come up with something to cover it so used unnamed Glamour glitter as a gradient and then Midie no. 8 on top. Here's a pix at this stage...you can see my really bad job of lining up the tips and I think if you click on the middle finger, I'm sure you can see the wrinkle too. You can also see my multi stampings of the french tip to make it thick enough to cover my tips. What a mess! Anyhoo, I thought I better add some more stamping to cover up my french tip stamping fail, so used black Konad stamping polish and added a trio of flowers on the top of the tips using Konad m25. Then topped with SV to finish. Here's a pix of my right hand...I didn't do too bad of a job on the tip and the trio of flowers. I think my french tips still need some work, but I didn't mind how this turned out. In fact, I could easily see myself doing something like this again, maybe changing up the flowers or using another design along with the stamping colour. Maybe with enough practise, I'll eventually get it right! I, like a lot of other nail fanatics, am loving all the indy nail polishes that are available...so much creativity, so much selection, so much talent! Here's a mani I did using another indie; my first CrowsToes, Cheshire. Started by using a base of two coats of Sally Hansen Night Hydrangea. The pix below has no topcoat. Sally Hansen Night Hydrangea was a huge lemming and I was lucky enough to swap for a bottle a couple years ago...and as luck would have it, I stumbled across a back-up bottle not too long ago at a local polish outlet. Added a coat of CrowsToes Cheshire. A bottle shot of this awesome polish! CrowsToes polishes are glitter bombs...crock full of glitter! I have read out there in the blogeshere of some gals having to use a bit of thinner before application, but I didn't find the need to add it before application. Stamped with FUN Gold stamping polish, using Mash-40. CrowsToes polishes are available at llarowe; I also have a link on the tab on my homepage of Where I Get My Stuff. CrowsToes also has Halloween polishes recently released; you can check out her blog, the Polished Crow here for swatches! They too are available at llarowe. Today's the first day of fall! It's hard to believe fall is here already...where did the summer go? As soon as I received Oopsie Daisies Apple Picking in the mail this week, I knew I had to come up with a fall mani using it....Apple Picking simply screams fall in bottle to me! Here's what I came up with. I did quite a bit of swatching using Apple Picking because I couldn't decide which colour I wanted to layer it over. While I don't have pix to share (although I may update the post later), in addition to the colours I did use here, I swatched it over swatched L'Oreal Hyde Park, Sinful Colors Exotic Park, Essie Navigate Her and even bright reds......its looked awesome on EVERYTHING, light and dark. I'm also thinking that Apple Picking will look great over darker browns too. I had too hard of a time just picking one olour so decided to do skittles; these were the colours I decided to use for this mani. Here's a whole bunch of pictures with Oopsie Daisies Fall Picking on top. As you can see, it layered really well over light and dark colours. A little bit of a better close up on the fingers. Feel free to click on any of these pix for better view! Bottle shot of Apple Picking. This was actually one of those few times that I didn't really want to 'wreck' my nails by stamping on them, but ultimately decided to do french tip of leaves to add to the fall theme, yet the majority of the base could be still be seen through the stamping. Used Mash-27 and CND Gold Chrome on the darker colours and CND Copper Chrome on the lighter ones. Oopsie Daisies Apple Picking is available online via the Oopsie Daisies Etsy store...and remember to use code HALLOWEENHARVEST for 10% off until September 25th! Hope you're enjoying the first day of fall! I'm up in cottage country and went for a drive this morning as I love looking at fall leaves, but they are just starting to turn so there wasn't much fall colour to see. But with these cool nights we've been having, I'm sure the leaves will be changing in no time. In the meanwhile, I'm off to make a huge pot of homemade soup...which will be perfect for the cool, damp, overcast weather...aka...fall weather...we are having today! Turning Oopsie Daisies Strawberry Trifle into Strawberry Shortcake! I just found out that Oopsie Daisies currently has 10% off with code HALLOWEENHARVEST over at Oopsie Daisies Etsy shop until September 25th! This is one of the polishes, Oopsie Daisies Strawberry Trifle**, which is part of the Sweet Treats collection. The above pix is with one coat of Strawberry Trifle, no topcoat. I adore the awesome red glitter peeking through the base polish! Below is Strawberry Trifle, two coats, no topcoat. Just before I added stamping, I did top the mani off with a coat of SV, as you can see below. I think the next time I wear Strawberry Trifle, I'll leave at one coat to see more of the awesome red glitter that peeks through the base. I was so in love with the glitter that I took a brush and removed a little of the base over a couple pieces so it would shine through, which is why a couple of the pieces seem more pronounced than in earlier pix. I had though about taking a cotton swab dipped in acetone and doing a quick swipe so that the glitter would pop but ultimately decided not to only because I've never tried this method before and didn't want to ruin the polish! Maybe next time though. Or leave at once coat as it had great coverage and there was lots of glitter visible. I have to be honest with you, all I could think about was strawberries when I was doing my nails. So it was a no brainer when I decided to do some stamping that I ended up using....strawberries, what else! This is what I came up with. I was surprised that in fact there are soooo many strawberry images available to use. The plates I decided to use were CH42 (thumb), W229 (Strawberry Shortcake and her pet), KD7 (ring finger) and Mash16 (large strawberry on index). I also isolated one of the strawberries from the full nail image on CH42 and randomly stamped it on index, middle and pinky. The pinky also has one of the images from Mash16. Konad red stamping polish was used. And for some added colour interest, added random dots using Konad green stamping polish. I did my right hand a little differently and thought I'd share a couple pix of it as well. The pix below is after stamping and dots. I actually like how this hand turned out better than the left! I know this is a little cutesy (probably the understatement of the year!) but I was loving this mani! In fact, I did my nails Sunday night and am still wearing it now as I finish up this post. It's been wearing really well too. Here's a pix that I took last night; you can see there's only minimal wear on a couple fingers right at tips even thought I bang away at a computer most of my day (and have been working 12-14 hour days all week!) So I was really pleased with the wear of this polish. 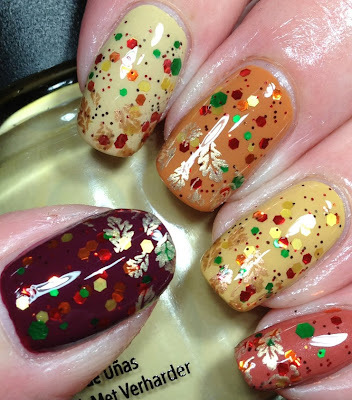 Oopsie Daisies also has three new polishes available, including Halloween Fall Harvest Duo, that look absolutely fantastic! The two polishes in the duo are Mischief Night and Apple Picking, please go here to see them! As mentioned in my last post, a winner had been picked from my impromptu giveaway. There were 15 entries. And as chosen by random.org....Marcia! Congrats! I've already emailed Dashica your three plate choices as part of my order, so I guess all you need to do now is send me an email with your mailing address for when they arrive I can send them your way! And if you happen to have a wishlist of polish lemmings, I'll see what I can do about quashing a couple. No promises, but I'll see what I can do! **This polish was sent for review. Please refer to my disclosure policy for further information. Edited to correct image plate W229 was used, from W228 as originally posted. A Leafy, Comparison, Plate Review Post! Yesterday's FB Adventures in Stamping challenge was 'leafy'. When I set out to do my nails for the challenge, after picking out a polish to use, I thought I do a little polish comparison at the same time with a few others in my stash. And heck, while I was at it, show a few pix of the new LeaLaC A plate. But before I get to the comparison and plate pix, here's what I came up with for the leafy challenge. Stamping polishes used were FUN Gold and FUN Green Metallic using A20 (thumb) and LeaLaC A (or LLC A as it's noted on the plate) for rest of the fingers. Topped with SV to finish as shown in first pix. I'm sure curiosity is killing you as to which polishes I used, so here's another pix again just for good measure before I list them. Polishes used were OPI German-icure by OPI (thumb), OPI La Boheme (ring finger and index) and Sally Hansen Ruby Emerald (middle finger and pinky), all two coats. Did you guess correctly? The above pix is all the same polishes, but one coat. OPI German-icure by OPI (thumb), OPI La Boheme (ring finger and index) and Sally Hansen Ruby Emerald (middle finger and pinky), I must add that the thumb is one very generous ( and sloppy!) coat. There's been some comments out there in the blogesphere if OPI German-icure by OPI is a a close to or dupe to OPI La Boheme...and it clearly is not. A great fall shade, but close to or dupe it is not. OPI La Boheme and Sally Hansen Ruby Emerald on the other hand, are pretttttyyyyy close, probably even dupes to me. I didn't notice any negligible difference. If you have one, you wouldn't need the other, recognizing that if you don't already have them in your stash, they will be pretty hard to come by, sorry. I bought OPI La Boheme a few years ago on eBay before prices skyrocketed; I know there are couple versions out there and to be honest, I don't know if I have the good or the bad one, but the pix below is what my bottle looks like. While there is this awesome flash in the bottle, I couldn't coax it onto my nails unfortunately. But it is gorgeous on the nail none the less! Heck, so is Sally Hansen Ruby Emerald! The only comment I'd have is that I wouldn't 'waste' La Boheme or even Ruby Emerald in the future if I was going to just stamp on it anyway because all the awesomeness of them was pretty much lost when stamped over as you can see from the pix above. Maybe next time, I'd do a little french tip or a small design. I did say I did a little a plate review in this post too, so here are couple pix of the new LeaLaC A plate that arrived last week. These are truly some of the largest designs I've seen on plates! SdP V, which I'll soon be reviewing too, is really the only other plate that is even close in size to these images. However, as you can see from the pix below, some of these images are too big for my nails. I can still extrapolate parts of images to place on my nails, but some will be lost on me, like this one unfortunately. My largest nail, my thumb, is simply far too small to fit this cool dot design on it. But I will have to come up with a cool way to use it as it is awesome! The picture above is my thumb nail up against the image from LeaLaC A that I used for the mani for the leafy challenge, just so you get an idea of how large the design. Another view of it up against my nekkid index finger! These designs are very large. So large that they in fact will not totally fit onto the XL stamper as I discovered when I was testing them. The above pix shows the XL stamper up against the image. It's close, but the image is larger than the stamper. The same image compared to Konad stamper. I wonder if in fact there's going to be a new stamper out on the market soon to accommodate these large images as they do not fit entirely on the XL stamper....maybe an XXL stamper? But one things for sure.....you can tell that I sure won't be needing it! I'm good with the Konad size stamper! In fact, the only reason I even have the XL stamper is that it picks up some images better than Konad stamper and I need to use it on occasion because of plate manufacturing variations. But if you have long or wide nails, you may wish to look into LeaLaC A and B, or SdP V, which I'll be doing a comparison post soon too! LeaLaC A and B are available via llarowe; also listed in the tab Where I Get my Stuff on the homepage. Hope you had a great weekend! Btw, a winner for the impromptu giveaway that I had last week has been picked as determined by random.org; I'll announce it next post!